Author’s Notes: Well, here are two more comics because of missing Tuesday. We’re almost to new material which will be one per week. Most of the third season is randomness and shocking truths. That said, the third season is my favorite so far. The first comic here is about games like Lumines and Meteos that use flashy presentation to push a concept that should stand on its own as good. 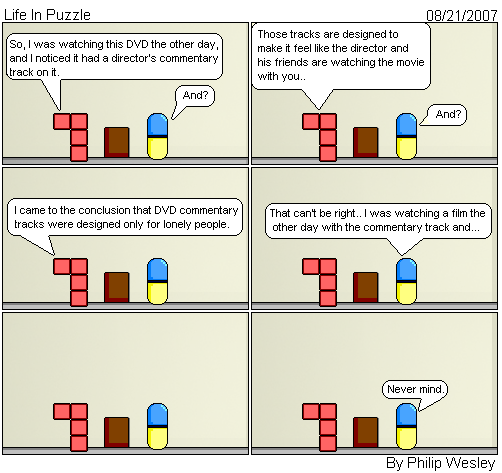 The second comic is something I realized when listening to a DVD commentary on a Pixar film. Most director/cast commentaries are for lonely people. It’s incredibly true. This entry was posted in Life In Puzzle and tagged commentary, dr, dvd, in, life, lumines, mario, puzzle, tetris. Bookmark the permalink.